The long break between theme 15 and the live material of Live In The City Of Light was taken up with various live projects and involvements with the Mandela Day concert. This did lead to two memorable tracks, both included on this release. Mandela Day, penned specially for the Wembley concert 11.6.88 to celebrate Nelson Mandela's 70th birthday, was a suitably spontaneous affair, written and recorded in a very short session. This celebration of the unquenchable nature of the man's 'myth, his values, all he stands for', thankfully proved prophetic and was to be followed up within two years by his appearance at the second Wembley concert. The association with the song Biko also stems from the Mandela Day concert. Peter Gabriel had helped the band out earlier in their career, offering European tour support in the months immediately after Empires And Dance, a difficult period around 80/81 when they were 'in between' record labels. He joined the band onstage at Wembley for this song and was encouraging about their plans to record it for the next album. Belfast Child, the first track on this EP was a bold choice for the first studio single release in over two years. It proved unfounded any concerns about being too long to be a commercial success; charting at 2. With record comapny staff frantically assembing specially 12" boxed versions to go into the shops the following weekend, the single received the extra impetus needed to take it to number 1 the following week. This Is Your Land entered the charts while Ballad Of The Streets lingered on. Featuring a guest vocal section by Lou Reed (Jim: "I asked Lou Reed to do a parody of himself. He said: 'No problem. I can do that. Everybody else does it'") this single peaked at 13. The 12" contained a particularly good selection,, featuring two tracks not available on any album release; Saturday Girl and Year Of The Dragon. Street Fighting Years [released May 89 Virgin CD - MINDD 1] was an instant success, hitting number one in its first week of release - the incredibly rapid sales reflecting the dedication of the many loyal fans, who had been waiting nearly four years for a new studio album. theme 18 contains an amalgamation of the standard 12" release; the album version of Kick It In, an 89 remix of Waterfront, Big Sleep [Live] and the bonus of the Unauthorised Mix of Kick It In - a radical reworking of the album track by the production team Stephen Lipson and Trevor Horn. A number 18 and the 14th top 20 single represents the final commerically released single to date. Two version's of Prince's Sign O' The Times along with the album track Let It All Come Down and a version of the William Blake hymn Jerusalem. Verona fills in the live story with three tracks from the concerts in Verona onver the 14th and 15th September 89. A number 1 music vdeio, this brought the 'music travelouge' full circle, capturing the band in full effect, with songs from the most recent album; Street Fighting Years, Mandela Day and Kick It In; the latest line-up on a limited edition CD EP which will not be available outisde this boxed set. 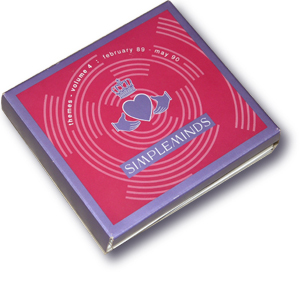 Limited edition digipak box set containing five picture CDs with sleeve notes. Project Managed by Martin Hanlin, Ged Malone and Jason Day. Box design and artworking by Kate Gaughran for the Red Room at EMI. Original digipack design by Assorted Images. The reissue is made of glossier but flimsier card then the original Themes Volume Four pressing. The cover artwork is the same except for the catalogue number, removal of the barcode, and a slightly different font for the back cover. The box is constructed slightly differently with the left flap opening before the right. The CDs themselves have sharper, clearer graphics (with the exception of the The Verona EP but sport extra catalogue and copyright information. And the sleeve notes are rendered in red instead of black.